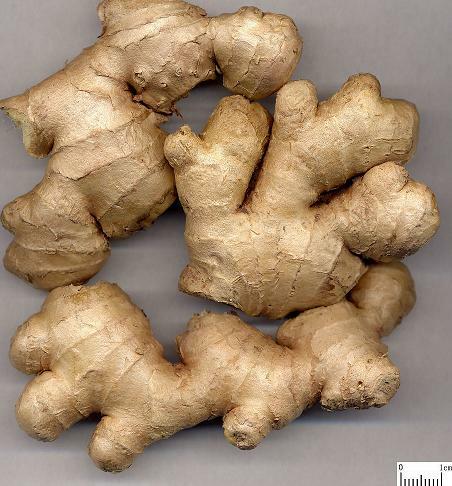 The fresh rhizome and root of perennial herbaceous plant Zingiber officinale Rosc. of family Zingiberaceae. Sliced, unprocessed, roasted or pounded into juice. Disperse wind-cold, warm the middle energizer to stop vomiting, warm lung to stop cough. This herb has mild action of dispersing wind-cold, and also has a little effect in promoting sweating and releasing exterior. It can be used singly in slight wind-cold syndrome as well as decocted dominantly with shallot and brown sugar. Usually it is used as a supplementary herb and can be combined with the pungent warm exterior-releasing herbs as Gui Zhi, Qiang Huo and so on to strengthen the sweat-promoting and exterior-releasing effect. With the action of warming the middle energizer and expelling cold, it is effective in expelling cold, stimulating appetite, stopping vomiting and pain when treating cold-invasion to the middle energizer or stomachache, poor appetite, vomiting due to the deficiency and cold of the spleen and stomach. It can be combined with interior-warming herbs such as Gao Liang Jiang, Hu Jiao and so on in treating severe cold. In treating qi deficiency of spleen and stomach, it should be combined with spleen-tonifying and qi-invigorating herbs like Ren Shen, Bai Zhu and so on. Because of its strong action in stopping vomiting, it has been regarded as the best choice in treating vomiting. Because of its warm property, it is the best choice for vomiting caused by stomach cold. In the case of vomiting due to stomach heat, it should be used with vomiting-relieving herbs such as Huang Lian, Zhu Ru and so on with both effect of clearing stomach heat and relieving vomiting. In case of vomiting due to phlegm, it is usually combined with Ban Xia to strengthen the effect of harmonizing the middle energizer and relieving vomiting as well as reducing the toxic effect of Ban Xia, such as Xiao Bai Xia Tang in Jin Kui Yao Lue. Because of its lung-warming and cough-relieving effect, it can either be used in diseases due to external wind-cold with more or less phlegm. In the case of cough due to external wind-cold, it is usually combined with Ma Huang such as San Ao Tang in Tai Ping Hui Min He Ji Ju Fang. In the case of profuse phlegm without external pathogens, it can be cornbined with phlegm-resolving and cough-relieving herbs like Ban Xia, Ju Pi and so on, such as Er Chen Tang in Tai Ping Hui Min He Ji Ju Fang. In addition, it can reduce the toxic effect of unprocessed Ban Xia and unprocessed Tian nan Xing and food poisoning caused by fish and crab. 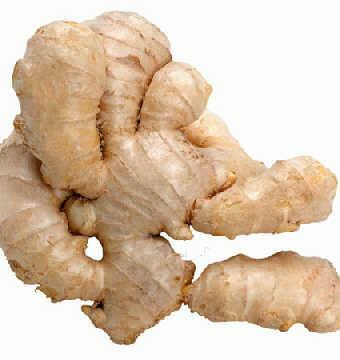 In the case of sudden syncope, take ginger soup or ginger juice or use ginger juice to drop into nose. Decoct 3~10g. In the case of sudden syncope, 10～20g Sheng Jiang juice is to be used. As Sheng Jiang juice is good at relieving vomiting and first-aid syncope, so in the case of serious vomiting and syncope, take it with water or drop it into the nose with 3~10 drops. Roasted Sheng Jiang is specially used in warming middle energizer to relieve vomiting. In case of syndromes not suitable for pungent and dispersing herbs, it should be carefully used. It should be used with cautions for yin deficiency with internal heat and heat exuberance because it helps promote fire and injure yin.